Mountains: Gebel Sham 3017 m., Gebel Simhan 1463 m.,Jebel Akhdar. 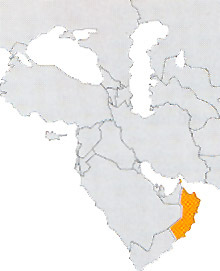 Desert state of the southern Arabic peninsula, big how Italy, it is placed to east of Yemen and south of Saudi Arabia. It has an only 10 ab/ Kmq density; it is a monarchy absolute (sultanate) where parties are not admitted. It has big deposits of natural gas and also of petroleum that obtain heavy wealth to the sultan and evident wellbeing to the population. Infact sanitation and education are completely free and well organized. Mountain landscapes, oases, wadi, desert and coast are very beautiful. Fortes, there are a lot of these in Oman, are big buildings, often amazing. The old city of Nizwa, well renovate, is a fascinate place, where mix togheter traditions and modernity. The capital Muscat, from small port between the mountains, now is becoming a big centre with about 1 millions of inhabitants.